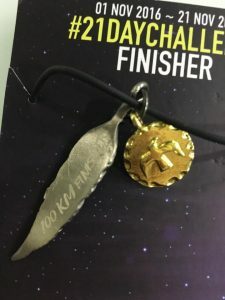 First 42.195 km after becoming a mum of TWO | JustRunLah! 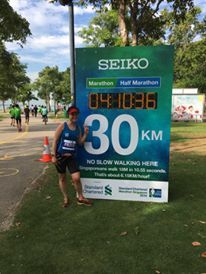 About slightly more than a week ago, I ran in my first full marathon at SCMS after becoming a mother of two. It took me a long time to pluck up the courage to sign up for this run. People who knew me thought I was out of my mind. My dad cautioned me one night pre-race to “just run for fun” and “don’t push myself too hard”. You must be wondering why the concerns. I just gave birth last year in 2015 to my second child. My oldest child is four and a half years old. The last marathon I ran was about five to six years ago. After giving birth to my first child, I was planning to return to long distance running. Then came along the second one. I really thought I was retiring from running marathons. However, I did it! I completed the marathon with a 6:04 gun time and 5:34 nett time within a year of training. I do get people asking me how I trained especially with two children and no help at all. So, here’s a blog post to share my “secrets”. The real marathon starts here. It’s all in the mind!!! 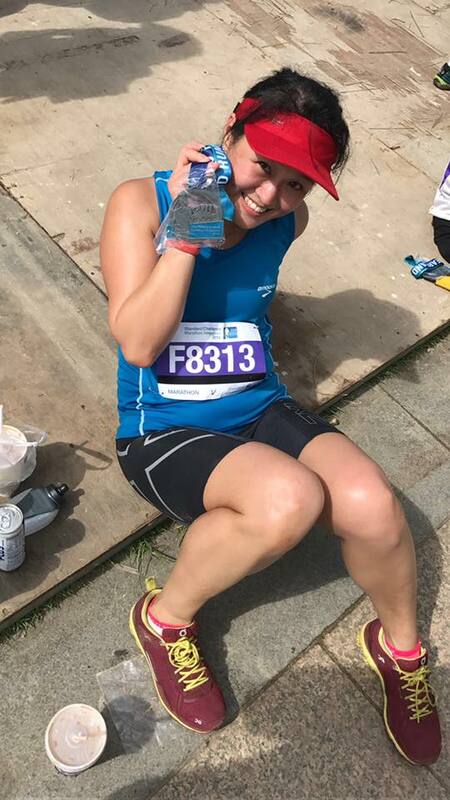 Marathoners know that running marathons is no joke. It takes a lot of discipline and commitment to train. Without proper physical, stamina and endurance (mentally and physically) training, running a marathon is a killer. Yet, there are many who did it though completing with much pain and longer timing. I salute their courage. If they could do it, why not me? Training began this year (2016) with the desire to lose the pregnancy weight (and fats). 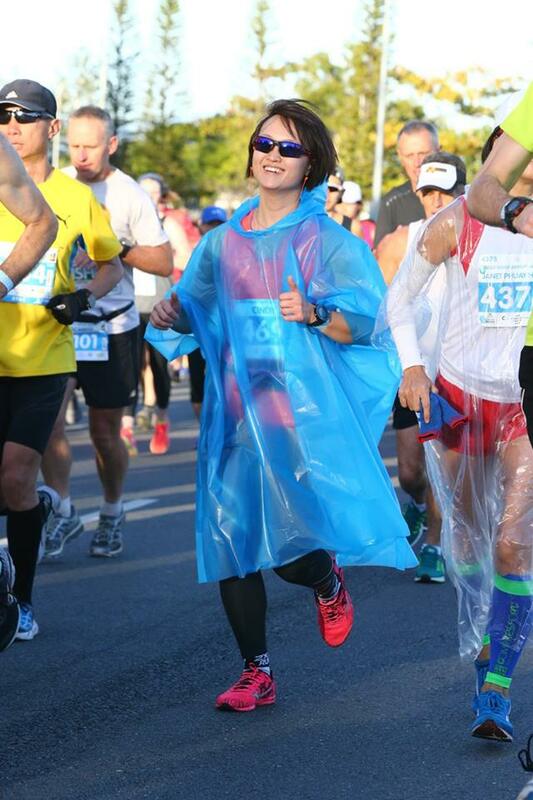 I took part in the first half marathon with 2XU Compression Run 2016 and surprised myself with a 2:30 timing. I went on to conquer Shape Run 2016. When I finished the Army Half Marathon with a 2:15 and still felt strong, I decided to sign up for the run of my life. It took me two months after this run to consider. Yes. Two months… and I had to pay $100 for it because I missed the early bird rate. Then I went on to finish the Great Eastern Women’s Run half marathon with a 2:09 timing. I felt really ready for the marathon. Training was really challenging for me throughout the year. My training regimes included interval trainings, tempo pace and long distances. Seriously… it took a hell lot of discipline. I could only run when my kiddos were asleep – after 9pm or in the wee hours. So, imagine if I had to train for long distances, I would be waking at 2am to run or running right into the middle of the night. I usually ran alone due to the odd timings. Therefore, I could only run loops around my estate for safety’s sake. The craziest route I did was running through Yishun, Seletar, Yio Chu Kang, Ang Mo Kio, Hougang, Buangkok Green, Seng Kang, Punggol and then taking a taxi back home. It was the most exciting route but I did not feel safe running home. Towards the end of year, my training was also deterred by rain. It seemed to rain more regularly in the wee hours. Very frustrating indeed. I had to run in the rain a few times. I had to use ways to motivate myself. 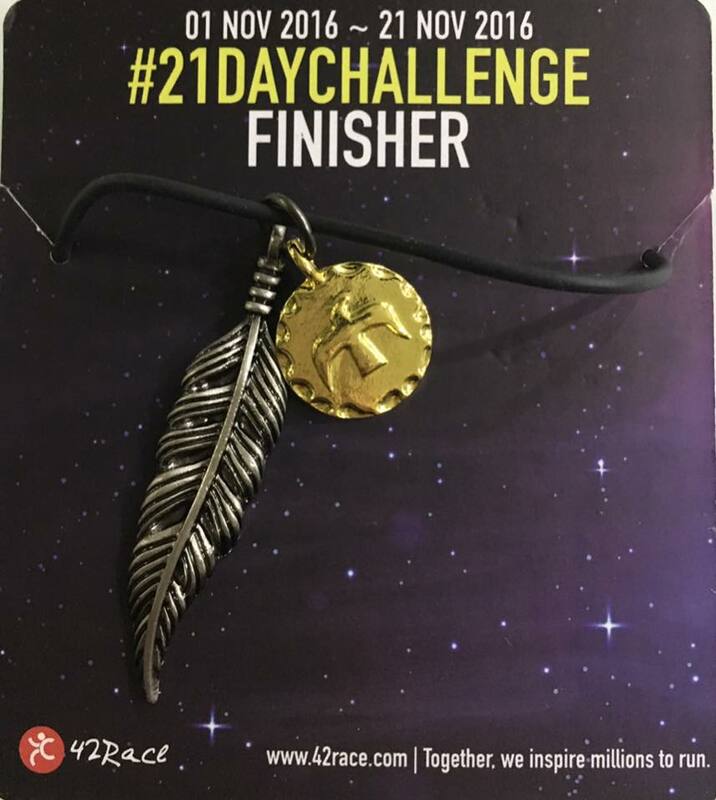 One of the greatest was signing up for 21 Days Challenge by 42Race. I signed up for it because of its beautiful medal and paid only $9.90. It came in the form of a pendant with a choker. 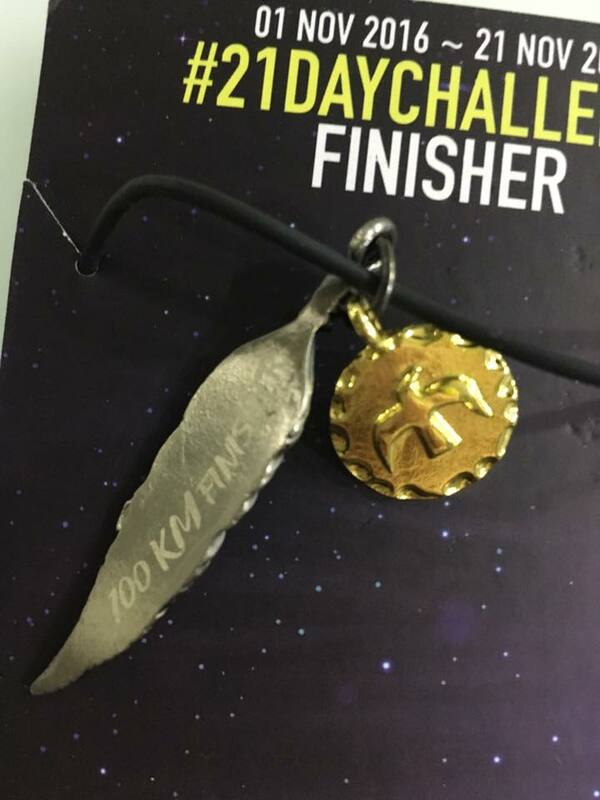 To get the medal, I had to clock the distance I signed up for (or I would have to receive one with a shorter distance). 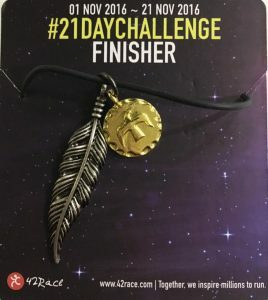 Signing up for this challenge was good because I had to get moving even when I did not feel like. It kind of force me to keep to my training right up to the end. This challenge was timely was it ended just slightly before the marathon and I was tapering off after the challenge. Besides the challenge, signing up for the races mentioned above also helped. As I saw my timing improved each time I raced, it motivated me to go further. And of course, in this time and age, using supports (and likes) from Facebook, Runkeeper and Whatsapp helped. I posted my timings and photos of my runs on these social media to “boast” my improved timings. The encouragement from friends and like-minded people was useful. I also read magazines such as RUN, Runner’s World and Shape to get an idea on form maintenance and to keep myself disciplined. 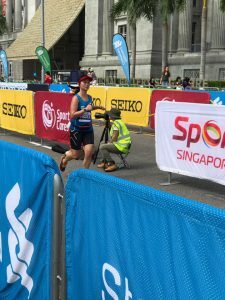 They usually share articles on how people transformed from amateur to avid runners and how running benefited their physique (and keeping slim and lean). Remember, I started out wanting to lose the fats? Well, I did not lose much weight as I gained muscles. I certainly became leaner and I could see shapes forming on my arms and abs. I look better when I wear more fitting clothes too. These are encouraging. These magazines also contain articles on eating well, training routines and the like. Lastly, I have a supportive husband who encourages me to keep on running. As an avid runner himself, he understands it is important to train. So, when I gave myself excuses, he would literally kick me out of the house. So, these are my “secrets”. At the end of the day, it really boils down to setting a goal and having the determination to achieve it. Isn’t it very similar to life? Looking strong but I was kinda’ in pain. I hit the wall at 28km when a pain on the knee set in. The rest was really a test of endurance. My next step is to join a running group (if I can… considering my lack of time). I already signed up for 2XU 2017 and took up the Urun All Access package. At the same time, my husband signed up for the Gold Coast Airport Marathon for both of us. So, guess what? I can’t stop running afterall. It is, “Just do it lah”! If you have any good suggestions on how I can run better, let me know! I’ll be happy to hear. And if you are inspired and want to run with me, PM me! 🙂 I’ll be happy to find more women’s runners. It’s boring at times running alone. So long, till the next post! Click here for more post from Cindy Ong. Congratulation to your good result in the recent marathon! I will love to meet up and hopefully run together with you 🙂 I have a regular group of running friends to run with but I am the only lady in the group. They are all very nice people whom have helped me tremendously in my running. But bring the only lady runner there , I sometime feel lonely. So having reading your story, I feel I can relate and will like to meet up with you! Wow…what an inspiration. I am a working father and thought waking up at 4am+ to train is early. And here you are waking up at 2am. I was there too but I ended my FM in disappointment. Nevertheless, the disappointment soon turns to motivation. The very next day I am back to training until now and quickly sign for another FM in Jan 2017 to avenge myself 😂. Happy Running!